One of the most frustrating aspects of being a high school librarian is failing to increase the level of leisure reading among the teenagers who frequent my library. There are a handful of dedicated readers who are as enthusiastic as I am about books; these students, mostly 9th and 10th graders, immediately notice when I change a book display and often linger by my desk openly chatting with me about their latest reads. 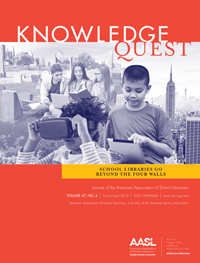 But the majority of students–and there are dozens of them in the library each period throughout the day–are too tied down with school work to even think about taking a break to read something unrelated to their academic life. The month of March presents an exciting opportunity, one that gives me hope for the future of readers. I am a huge fan of the NCAA March Madness basketball tournament and love creating a bracket and competing with family members and friends as we watch the college players perform their magic. So when I began working in my school last year, it was a natural progression for me to extend my love of this tournament into a library event. I start by choosing 16 books that I have read, including many YA titles but also some adult books appropriate for teens. I then make a book bracket modeled after the basketball tournament, randomly placing the books. 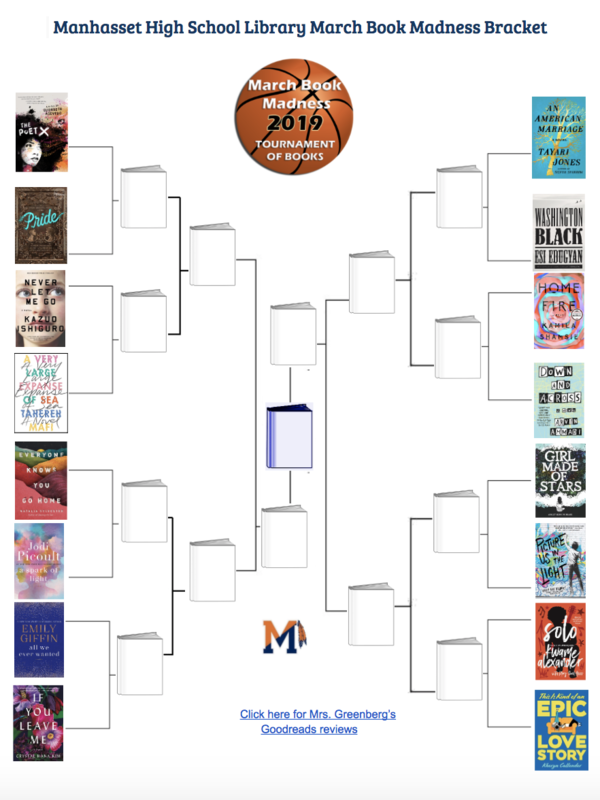 I print out a color copy of the bracket, along with a book voting tally sheet, and walk around the library giving brief book talks about each book. Based on what they hear, the students cast their votes for the books they would choose to read first, and write their names down to be entered into a raffle. Each day I focus on as many pairs of books as time allows, and by the end of March, we’re down to two in the finals. The winning book is announced over the school loudspeaker and through number generator I choose one student from the pool of participants to receive a copy of the winning book. 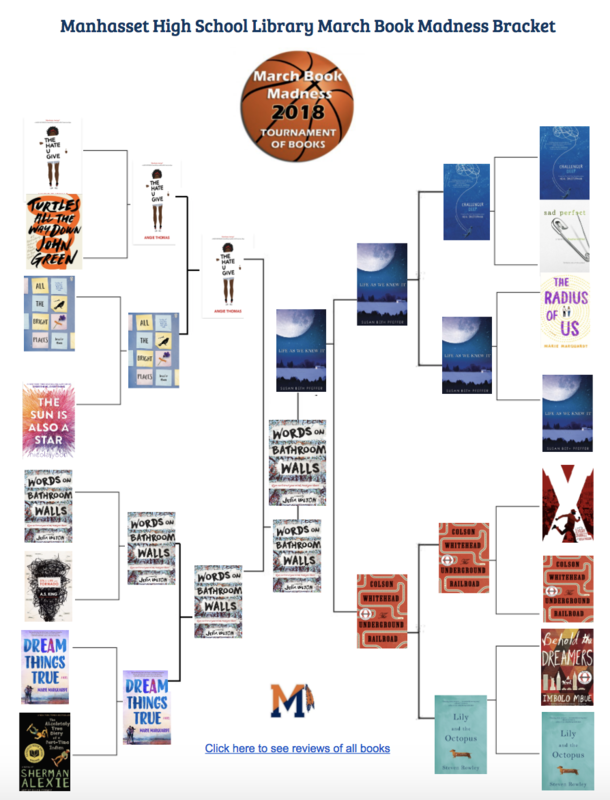 It wasn’t until the voting was over and we announced the winner of last year’s March Book Madness Tournament that I saw the ultimate reward: students began coming into the library requesting books from the bracket. 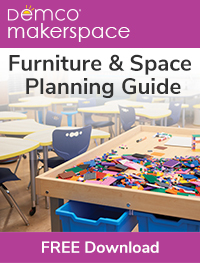 I had waiting lists for the most popular ones, and sometimes students took out another one from the bracket that wasn’t their first choice, but was familiar from my book talk. I would love to say that reading has increased significantly as a result of our March Book Madness, but that dream hasn’t materialized quite yet. What has happened, though, is that I’ve successfully introduced teenagers to a wide range of novels and encouraged them to take note of these works of literature. The way I see it, even if a few of them read more than they would have as a result, then I’ve done something to increase reading for pleasure. And knowing that I’ve had these students’ ears for each five-minute book talk helps me to believe that the knowledge of what’s out there in the literary world will remain in the backs of their minds until they’re ready to pick up their next book. 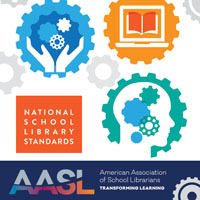 Karin Greenberg is one of the library media specialists at Manhasset High School in Manhasset, New York. She is a former English teacher and writes book reviews for School Library Journal and Woodbury Magazine. She co-hosts Bookscreenz Podcast with her daughter, Annabelle. In addition to reading, she enjoys animals, walking, hiking, the beach, and spending time with her husband, three children, and dog. I have been hesitant about creating a March Madness Reading Tournament after reading the way other Librarians are able to accomplish this. After reading about the way you were able to manage this, I felt I could give it a try. I too wish I could find ways to encourage more recreational reading without necessarily forcing the issue. I like the fact that you don’t necessarily require them to read the books. It is a struggle for them to read the Texas Bluebonnet Reading List so that they can choose their favorite but this can be a good alternative where they can be intrigued as to something they may “want” to read about. I may also be able to intrigue them to vote on their favorite which may appear at our Spring Book Fair. Thanks for the valuable information. Great idea to motivate HS students! MHS is lucky to have Ms. Greenberg as one of our dedicated Library Media Specialists.